In addition to creating her own movie-quality costumes and props, she creates instructional video tutorials and full costume build write-ups to foster a positive and encouraging community of makers. She enjoys giving others a thorough look at her build processes, and she strives to provide detailed write-ups of each of her builds whenever possible. Her mantra is to be as transparent as possible, and she is always willing to share her successes and failures along the way. Beverly is well known for her detailed and high-quality, screen-accurate builds. 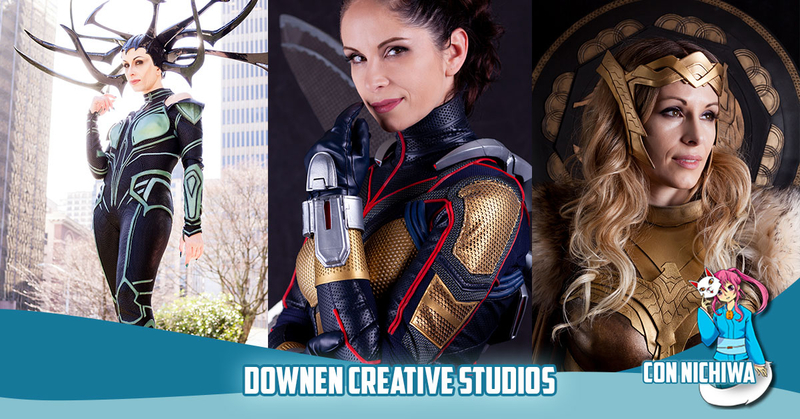 Most recently, she was commissioned by Marvel during the 3rd season of “Marvel Becoming” to create a replica of the Wasp costume from the blockbuster movie “Antman and the Wasp“. Additionally, Beverly is also a Thibra Ambassador, and produces an ongoing video tutorial series called “Cricut for Cosplay“, which focuses on sharing step-by-step techniques and settings for Cricut die-cutting machines, a robust and affordable building tool many makers utilize for their projects. She has been published in Cos Culture Magazine, and is a contributing author for the German cosplay magazine Cohaku, and to-date has cowritten two tutorial articles with her husband in the last two years. Her passion projects are all community focused; she has founded several maker/builder Facebook groups with the goal of fostering a positive and supportive environment for cosplayers and makers alike. In 2018 she founded SheProp!, a rapidly growing group created for female and LGBTQNB-prop makers and costumers. Beverly also hosts the ShePropTalk! Podcast, providing a platform for members of the SheProp! Community to share their unique design processes, techniques and experiences with the cosplay world. Beverly’s overarching goal is to bring her unique knowledge of building processes and techniques to cosplayers of all skill levels, to encourage her fellow makers to create, learn and inspire each other, as well as be positive role models within the maker community.